You're about to see some great resume examples for teens. You know that rocket Elon Musk sent up? The one with the cherry red Tesla roadster in it? You're like that. About to take flight with style. About to shake the pillars of the Earth. Between you and that bright future stands a door guardian called a hiring manager. To get past her with flying colors, you'll need a teen resume that really works. 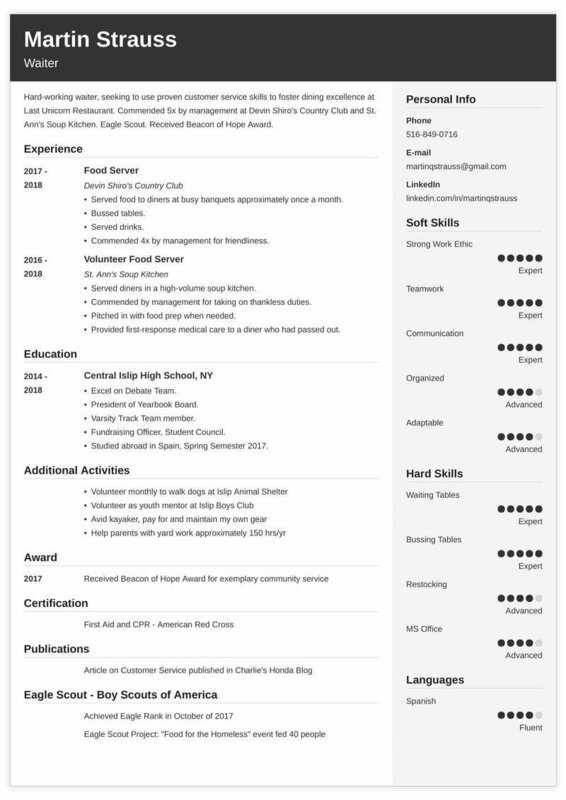 Resume examples for teens better than 9 out of 10 others. How to write a resume for teens that gets more interviews. Tips and examples of how to put skills and achievements on teen resumes. How to make resumes for teens with no experience and get any job you want. 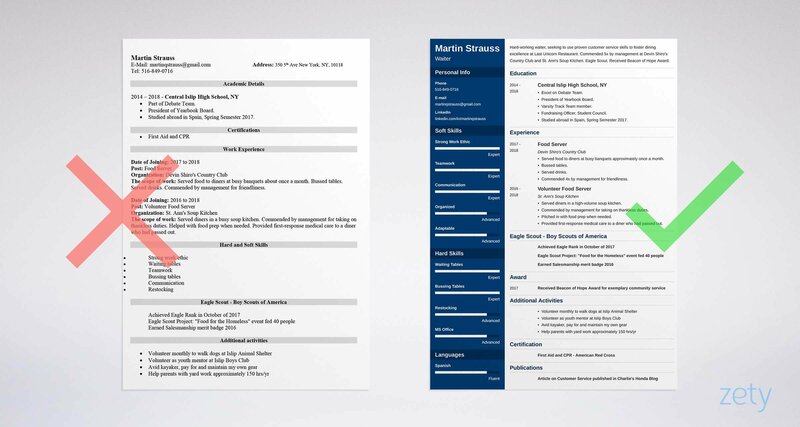 Here's a resume template for teens made with our online resume builder tool. Nobody really cares about your teenage resume. Want proof? Hiring managers spend all of six seconds glancing at most resumes. Six seconds!!?? That's hardly enough time to read your contact info! With the right resume for teens, you can turn that sliver into an interview. Hiring managers look for very specific things in a resume for teens. Give it to them fast with the right resume format for teenagers. That means dividing your teen resume into the right sections. What Should I Put on My Resume for My First Job? Let's put you behind the driver's seat so you can nail down every section of your resume for teens. Pro Tip: Should you send a teenage resume PDF or Word Doc? Everyone says PDFs confuse the hiring software. Guess what? Modern PDFs are machine readable. As long as they're not forbidden by the job ad, go for it. Want to dig deeper into resume formats? Getting your teen resume format right can send the perfect message to the manager: See our guide: Resume Formats: How to Format a Resume for Greatest Impact? Using resume templates will half the work you’d have to put in. Just pick a template, follow our advice, and you’ll have a perfect resume in no time! That’s three. But there’s more where that came from! 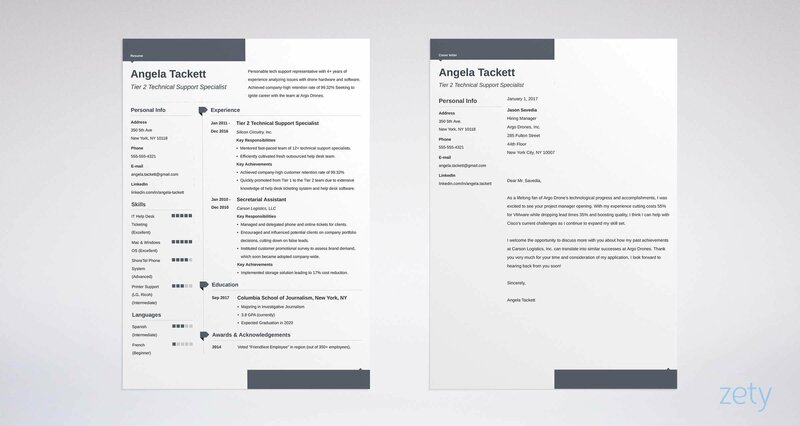 The Zety resume builder features 20 templates that make great teen resumes. Simply pick a resume template and build a teen resume here. This is not your dad’s teen resume. Back before dialup, contact info on a resume was easy. Phone Number. List just one. Professional Email. No spongebobnopants127789@hotmail.com. Try something more pro-level like john.doe@gmail.com. Social Media. LinkedIn, GitHub, Twitter, Facebook, Tumblr, Instagram, Pinterest? Just pick the one or two with the best evidence you fit the job. Don’t include any if you use them to only share dank memes. We love ‘em, employers don’t. Personal Website. Got a portfolio site? Write for a blog that shows you know the job? That’s gold on a resume for teenagers. Add it. Start a resume for teens right, and you’ll get that response. Do it with a teenage resume objective. But there’s a way to do it right and wrong. See these two very different resume examples for teens to get a clue. Enthusiastic waitstaff applicant with no experience yet but very willing to learn and work very hard. I could really use this job so please hire me. You won’t be sorry. Wow, right? Who brought Carl Grimes to the labor pool? Hard-working waiter, seeking to use proven customer service skills to foster dining excellence at the Last Unicorn Restaurant. Commended 5x by management at Devin Shiro's Country Club and St. Ann's Soup Kitchen. Eagle Scout. Received Beacon of Hope Award. Now we’re talking. I’m not sure, but that just might be Peter Parker. Achievements really sell a resume for teenagers. They offer what the manager wants: a hard-working teen who cares about doing a good job. Pro Tip: Resumes for teens need short, sweet objective statements. Stick to 60 words. Need more space? Write a great teenage cover letter. Even with no experience, you can make one that gets interviews. We’ll show you how later on. You really want that job. It’s not just money. It’s freedom. Independence. That’s what all your school work and accomplishments have been about. But now you’ve got to prove it on your teen resume. That starts with your education section. That’s the bare bones. But you’re up against 100+ applicants. You need to offer more. Let’s see that work in two more resume examples for teens. What’s wrong with this sample teen resume section? Hey, look, it’s Shoshanna Shapiro from Girls. 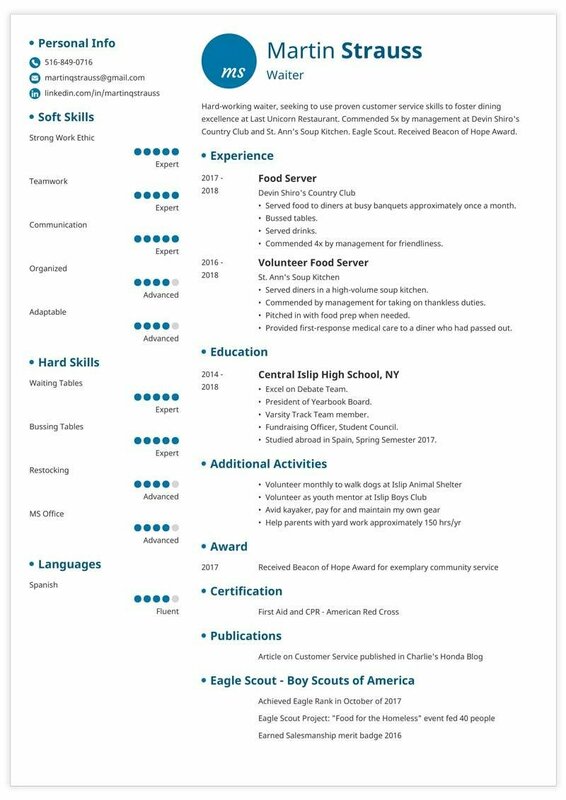 That high school resume example is generic. You really need to list achievements. It’s better if they fit the job. Who’s that, Aang from The Last Airbender? Yet resume examples for teens like that aren’t out of reach. It just takes a little head-scratching. Pro Tip: Do you have to add your GPA? Only if it’s impressive. If it’s below 3.5, feel free to cut it. You can use the space for more impressive details in your teenage resume. You’re writing a teen resume. 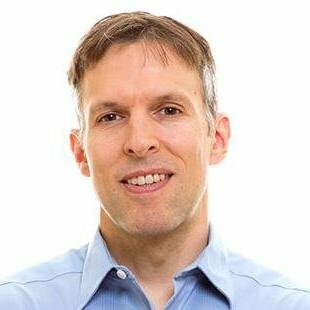 Everybody knows you haven’t been the CEO of Microsoft for 15 years. But 91% of recruiters want some kind of experience on resumes for teens. You’ve already got it, or you can get it fast. 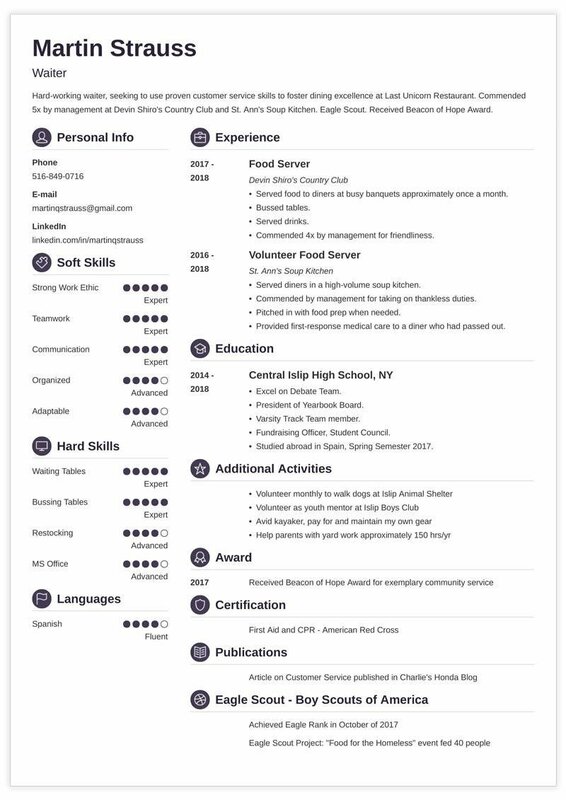 A resume for teens just has to prove you’re not a slack-jawed couch-muffin. So, have you walked dogs at the local shelter? Were you captain of the track team? Maybe you just did yard work for your parents every Sunday? Even that can work on a teenager resume. Served diners in a high-volume soup kitchen. Commended by management for taking on thankless duties. Pitched in with food prep when needed. Provided first-response medical care to a diner who had passed out. Wow, let’s hire the vampire slayer, right? Yet not a glimmer of full-time job! Experience: None yet since this would be my first job apart from babysitting but everybody says I’m really easy to get along with and I’ll work hard. Who wants to hire Joffrey Baratheon, right? That is not how to put babysitting on a resume. You should list babysitting achievements that fit the job. That’s the only way to match the best of our resume examples for teens. Which teleports us to our next section, on adding skills to a high school resume. Pro Tip: Still don’t have enough experience? Get some! Even a couple days of volunteer work are a solid teen resume builder that will supersize shrimpy resumes. If you were the hiring manager, who would you hire? Picture it: You’re at your desk. You’ve got a stack of 140 resumes for teens. They all claim to be the best choice for the job. You need to be that applicant. First: Focus on the skills shown in the job ad. Next: Show when you have used them. These two example teen resumes show how. Meet Barry. He’s applying for a job that wants customer service and a friendly attitude. Oops. Barry buried his key skills. He hoped the manager would like the extra skills. Trouble is, anyone can say they’ve got a lot of skills. A long skills list with no proof is like handing in a blank test sheet. Served food to diners at busy banquets approximately once a month. Commended 4x by management for friendliness. Who wouldn’t hire Hermione Granger. That resume for teens example will make the manager start mouth-breathing. No. The resume examples for teens above are very clear cut. In the real world, the job ad might not come out and say what skills it wants. If you’re vying for a waitstaff job, show you’ve worked with people or helped others. If you’re looking for a job in a kitchen, show you’ve handled stress, collaborated, and obeyed instructions. What skills go best on a resume for teens? Add job-specific skills like coding or graphic design. Soft skills transfer well to teenager jobs. Great teen resume skills, right? Now don’t believe them. If you’re going for a job where 95% of the clients speak Chinese, Chinese fluency counts more than 4.3%. Your job as an applicant? Prove you have the skills to do this job. Pro Tip: Prove your hard skills too. If the job ad says “MS Office” and you’ve been using that since kindergarten, say so! The manager doesn’t want to hire a teen resume. She wants to hire a person. Living. Breathing. But she wants to hire one she wants to work with. Prove it with special “other” sections on your resume for teens. In other words, show more than just experience or education. Hey, let’s not hire Steve Urkel. I’m pretty sure we got the Blue Power Ranger there. With every one of those achievements, the manager’s hiring gage is getting closer to the “Hire Now” zone. Can’t quite match those resume examples for teen jobs? You don’t have to be a superhero. Just use your best achievements. Pro Tip: You don’t have to list every activity. Keep your resume to one page, and just list things that fit the job. Wait, aren’t cover letters for people who grew up with rotary phones? That’s what many experts say. But they’re talking about generic cover letters. You need to make the manager want to read your resume for teens. You understand the job needs. You can fill those needs. Listen, we get it. Most teenagers don’t write cover letters. You don’t want to either. But writing one will make your teenager resume stand out! This (shortened) cover letter for teenager first jobs shows how. That’s a recent graduate of the Xavier School for Gifted Youngsters, no doubt. Last, end your cover letter with an offer. Pro Tip: Most teens don’t know to follow up on their job application. A nudge a few days after you send your teen resume and cover letter can put you on the map at the right time. Write a teenage resume objective. Use a 60 word count and stuff it with accomplishments that fit the job. Lock your experience and education to the job offer with matching bullet points. See the resume examples for teens above for clues. Use special “other” sections to show you’re more than just a resume for teens. Add certifications, hobbies, interests, and other goodies. Stand out from the crowd by writing a cover letter. Most don’t do this, so you’ll score some sweet brownie points! Do you have questions on how to write a great resume for a teen? Not sure how to describe your skills or achievements? Give us a shout in the comments! Let's get you in that job.